A veterinary technician checks a dog's blood pressure. basis. Excellent grades are necessary: entrance into a veterinary program is very competitive because of the small number of veterinary programs in the United States. The great majority of veterinarians are employed in private practice, but this is not the only employment opportunity. Veterinarians are needed in government to serve on medical and agricultural committees, to inspect meat and meat products, and to work in laboratories. Colleges and universities hire veterinarians to teach undergraduate and graduate courses and to conduct research. Overseas veterinary mission and Peace Corps work is available. 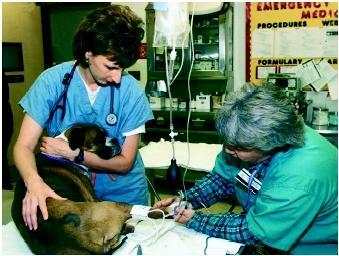 Large research and pharmaceutical companies often have veterinarians on their staffs. A veterinary degree is extremely versatile and useful, particularly when combined with an undergraduate degree in a biological science. Hurwitz, Jane. Choosing a Career in Animal Care. New York: The Rosen Publishing Group, Inc., 1999.